Thank you 2018 Employment First Conference Sponsors! he passing of Wisconsin’s Employment First law in March 2018 was a major milestone in our state’s efforts to support people with disabilities to pursue community employment goals. This was a momentous occasion for many advocates, schools, and service providers throughout Wisconsin who have engaged community members and policy makers for almost a decade to bring us to this day. In this next chapter, we must strengthen our efforts to ensure our Employment First law lives up to its promise and people have the resources and support they need to pursue their goals. Employment First doesn’t mean ‘employment only.’ Work is one part of a full community life. People need friendships, hobbies, ways to give back and feel valued. We cannot simply help people into jobs and ignore the rest of their lives. If we do, people might not choose to work in the community or, if they do, they might become isolated and lonely as a result of not having a means to maintain friendships and engage in meaningful activities outside of work. An initiative to provide supports for “meaningful days” or “building full lives” must accompany Employment First policies in order to create the conditions necessary to move people out of facility-based services into competitive integrated employment and community life. Setting Meaningful Goals Involves taking the time ask and understand to key questions: 1. What do you want to do? 2. What do you need to learn? HELPING PEOPLE LEARN ABOUT THEIR OPTIONS Remember that “exposure precedes interest.” Youth and adults need to be supported to engage in a variety of opportunities and experiences, including tours, job shadows, volunteering and work experiences to explore their interests and build skills. These should start at a young age. Paid work experiences while in high school are essential for employment success as an adult. Providers and schools need to develop strong employer partnerships to provide opportunities for people to learn about and try new jobs. All stakeholders, especially families and businesses, need more information about inclusion, high expectations, natural supports, and employment for all. This information should be given out at school and CESA events, community fairs, etc. to help raise expectations about what people with disabilities can do. Find ways to turn challenges into opportunities. Seek out information and resources for transportation, assistive technology and adaptations, and best practices. Be creative! Provide soft skill training, use Discovery and personal inventories. Connect people and families to benefits analysis services to learn how they can work and keep the benefits they need. Provide more information to families about transition so they know what to expect. come into the jobsite. Many home health agency staff are not trained to provide cares in a workplace. Vocational agencies play a critical role in addressing this issue by training job coach staff to provide personal care when needed, helping home health agencies understand how to provide care in the workplace, or learn more about the adaptations people can use in order to meet their personal care needs more independently in the community. 6. Agencies struggle to adequately train staff due to high turnover rates and covering schedules due to staff vacancies. Yet, to provide effective supports, agencies must carve out time and resources to help staff learn how to teach skills using systematic instruction vs. allowing staff to default to the caregiver approach of doing things for people. While it may be quicker or easier to do tasks for someone, this takes away the opportunity for them to learn and gain independence. Agencies should recruit staff who want to be teachers, not caregivers. RESPONDING TO STATE AND FEDERAL POLICY CHANGES Stakeholders in Wisconsin are keeping up with federal law changes through emails, webinars, meetings and attending professional conferences with National Rehabilitation Association, Wisconsin APSE, Wisconsin Board for People with Disabilities, Disability Service Provider Network, Wisconsin Rehabilitation Shared Concerns Council, Division of Vocational Rehabilitation Policy Service providers and funders share Academy meetings, as well as other sources such as similar concerns about the new policies Public Radio International and Wisconsin Public Radio. Internally, service providers are supporting their staff to understand these changes through regular meetings, encouraging open dialog and participation in meetings with DVR, scheduling time to accompany people into the community, orienting production center staff on community service coordinator duties, and using visuals (such as TV screens in the hallways) to show people working and doing other meaningful activities in the community. Service providers have been using emails, newsletters, letters and calls to help individuals and families understand the changes. Some have conducted surveys to determine the goals and types of services and supports individuals and families want. Many use six-month prevocational service review meetings to have a two-way dialogue about the changes and new opportunities. having a clear vision of the direction they want to go developing clear and measurable goals adjusting and realigning their services to create a focus on community first negotiating contracts and rates before launching or expanding new services being thoughtful and leaving no one behind in the change process taking inventory along the way to change being creative decreasing the number of hours people can receive facility based prevocational services advocating for improvements to policies and practices participating in BPDD’s Building Full Lives service transformation initiative providing training to staff, strengthening local partnerships improving communication to the people and families they support Helping people understand the ‘why’ and philosophy behind the changes. Are we able to document people’s goals toward attaining goals? Do we keep in mind some people will take longer to reach their goals? Are we obtaining feedback from individuals and their families? Are individuals and their teams motivated, participating, and collaborating? Are schools, funders and service providers effectively and consistently collaborating at the local-level? Are funders and providers aligned with people’s plans and goals? Partnerships between funders and service providers have been inconsistent across the state. Many find they share similar philosophies about providing community-based services but translating these shared values into contracts that allow for flexibility and individualization and provide incentives for providing services in the community has been slow in development. 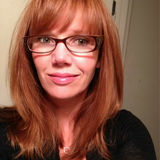 Once contracts are changed, education within the MCO is needed to help care managers understand the new service models. Proactive service providers have found backing-up rate negotiations with hard data, especially when transportation is involved, to be an effective way to negotiate rates with MCOs. Invite DVR to IEP meetings earlier; Focus more on clear, measurable outcomes rather than process; Improve collaboration between schools and DVR to provide job shadows and work experiences; Make more resources available to teachers, youth, families, counselors, service providers, etc. ; and Establish better methods for “handoffs” and exchange of information between state agency partners. Grouping and Scheduling – meaningful small group community services are much more complex than serving large groups of people in buildings. People need to be grouped by interests and goals. The community activities they engage in need to provide meaningful opportunities to build skills and develop relationships. Hiring, Training and Managing Staff – the competencies necessary to support skill building and connecting in the community are vastly different from caregiving or supervising production work. Supervising and retaining staff in the community, rather than in a building, also presents a different set of challenges. Managing Change – participants, families, and staff respond to change differently, and some people are very fearful of change. Service providers need better information and strategies to be effective in addressing these fears. Service providers rely on a number of different funding sources including Managed Care Organizations, IRIS funds, Division of Vocational Rehabilitation, United Way funds, small grants, private donations and foundation contributions, private pay, school district funds, and Ticket to Work revenue. Typically, the agency director develops the budget with input from business managers, after which the board reviews and approves the budget. To forecast the budget, they look at year to year trends and talk with their funders to understand the current market and predict the number of referrals they might receive. Predicting budgets has become challenging in this time of change, especially for providers who rely on value-added outcome-based funding rather than hourly fee for service models. Low wages paired with historically low unemployment rates have resulted in high turnover and position vacancies. Providers feel squeezed between increasing benefit expenses and unstable or decreasing service revenue. Many report experiencing mixed signals from their funders – even within the same area/office; being asked to develop new, more costly community-based service lines but finding care managers diverting people to other facility-based services or significantly reducing services. In order to evaluate the impact of Employment First policies, state agencies should improve their data sharing capabilities and increase their data collection methods. 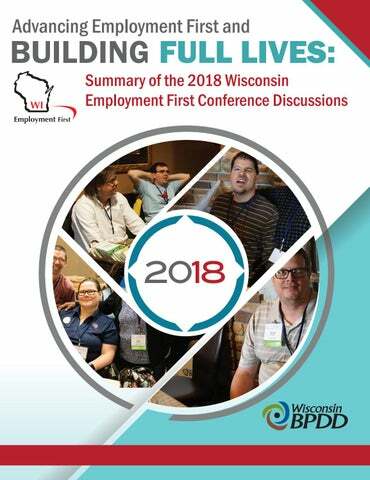 Beyond the simply looking at the % of individuals with disabilities working in the community, the following factors could be helpful in determining if Wisconsin’s Employment First Policies are having a positive impact: •	Timeframe to reach CIE goal. Has this timeline improved? •	Quality of Life Indicators both pre and post-employment - including time out of one’s residence in the community and health improvements. •	Correlation between the number of people receiving supported employment services and number receiving pre-vocational services. Are prevocational services in fact decreasing as supported employment services increase? •	Feedback from families about transition and employment planning – conducing exit interviews after DVR case closures. •	Cost analysis of services and Medicaid costs. Are we seeing a reduction in Medicaid cost when people are in working and spending more time in the community? How do costs vary based on the complexity of peoples’ needs? LOOKING AHEAD Many opportunities are available to support efforts to increase competitive integrated employment at both the grass roots and service system level, including: Wisconsin Employment First Partner Grants support individuals/organizations interested in engaging in community outreach activities in local communities that lead to increased community, integrated employment opportunities for people with intellectual and developmental disabilities. Applications are available at https://wi-bpdd.org/index. php/2018/08/07/employment-first-partner-grant-applications-available/ and are due August 22, 2018. Sparks Grants support local grassroots groups to make changes in their communities that result in aÂ positive impact on the lives of people with intellectual and developmental disabilities (I/DD). Applications are available at http://wibpdd.org/index.php/2018/06/12/sparks-grants-applications-available/ and are due August 31, 2018. Partners with Policymaking is a six-session advocacy and systems change training program designed to develop a group of future leaders across the state, who are able to work with legislators and communities on policies and initiatives that will support the full participation and inclusion of people with developmental disabilities in all aspects of life. Applications are available at http://wi-bpdd.org/index.php/partners-in-policymaking/ and are due September 1, 2018. Building Full Lives Grants provide technical assistance and coaching for service providers interested in service transformation. Applications will be available Fall 2018. Partners with Business Grants provide technical assistance and coaching for organizations interested in implementing the Partners with Business model of employment supports. This is a creative way to support workers with disabilities to achieve long-term success on the job by using a combination of natural and formal supports, both of which are provided by the employer. Applications will be available in early Spring 2019. To receive updates on upcoming opportunities, visit http://wi-bpdd.org/index.php/contact/ to sign up for BPDDâ&#x20AC;&#x2122;s newsletter and policy alerts.